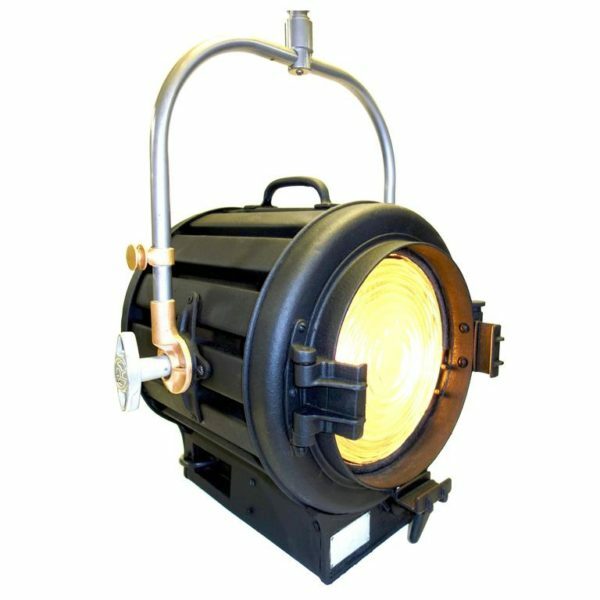 Offered for your approval, this 1939 Mole Richardson Model 410, thin slat, 2000 watt Fresnel studio light fixture. We have researched the correct factory finish for this 1939 light and have completed it in the factory correct ‘instrument’ paint finish and bead blasted the fixture yoke to expose the original Shelby Steel Tube yoke and the original bronze fittings. A correct vintage original on-off switch and original thick factory cable has finally arrived after a one year search and has been properly refinished and installed as shown in the last photos in this listing. Included is a new discreet wireless remote control on-off switch to easily engage power on this light. This remote is not visible on the light fixture but connects to the plug in at the wall outlet. 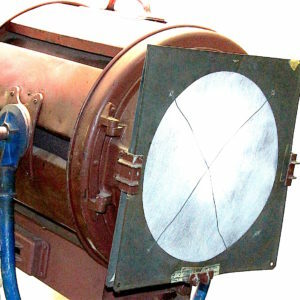 This studio fixture was owned and used by Paramount Film Studios until sold to us in 1988. It has sat in our warehouse waiting to be restored in a gentle and correct manner. 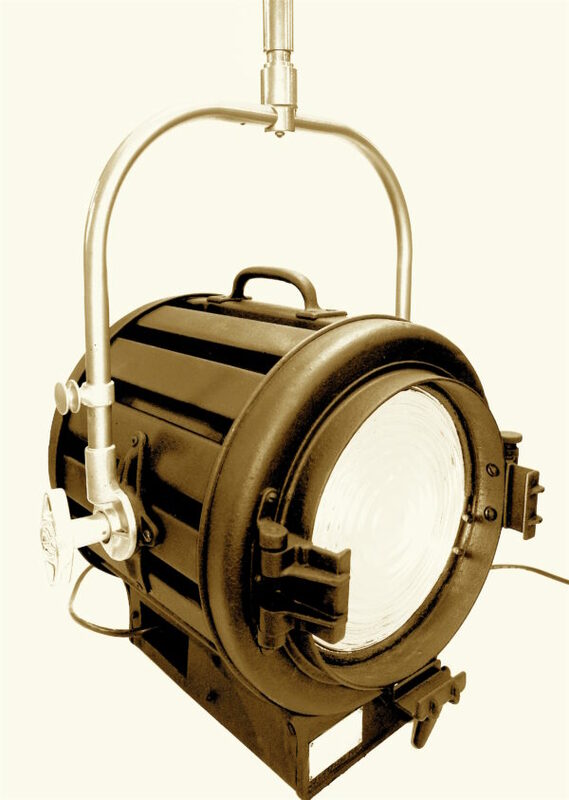 Consider the many famous Hollywood films shot with this light fixture from 1939 to the 1980s. 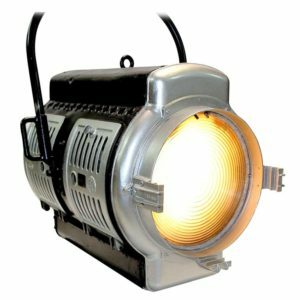 The original factory electrical internals are cleaned and de-wired but we have added a wired and socketed 2700 degree LED lamp for display purposes. A discrete wireless remote On/Off control is added for illumination activation, so that no visible, incorrect or modern switches are added to the fixture. A vintage Mole Richardson stand, finished in black gloss paint with original correct adjustment knobs, is currently in our paint shop being completed. This stand will be included. 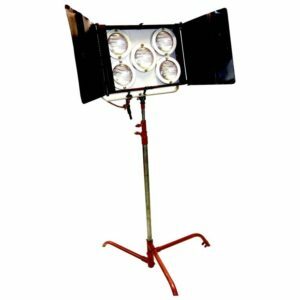 The correct adjustable light stand allows various heights. Please ask us for these measurement details. We supply shipping quotes for a buyer once we know his/her address, zip code, rapidity of shipping required and method of packing and shipment required. Free delivery in the city of Dallas or local pickup at our dock is gladly offered. A very rare, correct and very pretty example of an historic 1939 Hollywood Studio Artifact. 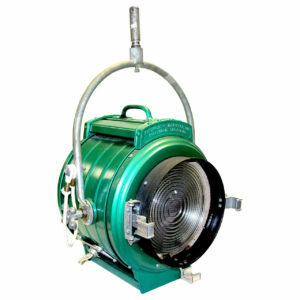 Mid Century 5000 Watt Cinema Studio Spotlight. No Front Fresnel Lens. Great Patina.